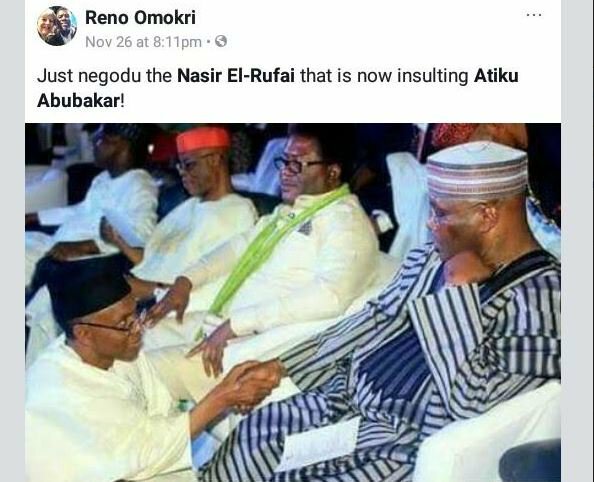 Former presidential spokesperson, Reno Omokri has posted an old photo, reminding Governor Nasir Elrufai of Kaduna State how he knelt, begging Atiku Abubakar when he was the Vice President. Late last week, immediately after the former Vice President announced his retirement from the ruling All Progressives Congress, APC, the Governor had described Atiku as a serial defector. 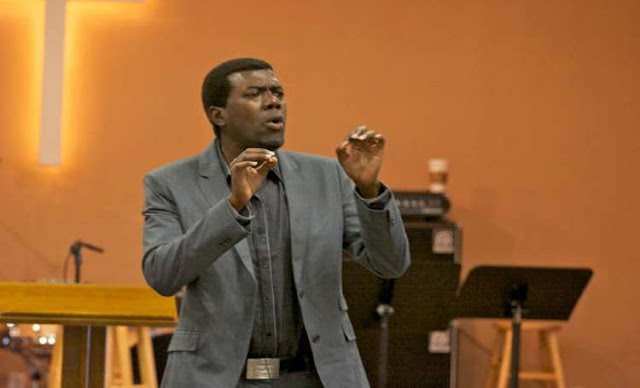 He said this when he addressed reporters after he joined President Buhari in observing the Juma’at prayer last Friday, saying that the party was already aware that Atiku would leave in December. I always see El Rufai comments as hazardous waste that need to be deposited into a landfill. Apc is party of maddogs. People without future.one is in imo state erecting status. Go to calabar, rivers and lagos state. That's the people with future as governors not opportunist. Haba, are we so daft that we cannot understand this is just greetings at a public function, most probably APC event. I noticed John Oyegun also seated there. But lest I forget, Reno calls lies "facts",,alternative facts that is! El Rufai supposed to be in jail by now but unfortunately, Nigeria is a place where corruption is highly celebrated. With all evidence against him when he was mminister of FCT, nobody is doing anything about it and shamelessly, he still have the courage to criticise anybody anyhow. I pity this country.